When I’m not at work or going out to dinner, this has pretty much been my uniform of late. These photos are from last Friday when some friends and I tried out Astro Doughnuts and Fried Chicken (the name says it all and yes, it is so delicious), followed by cocktails at Pacifico Cantina and Molly Malone’s. I made the absolute laziest “day-to-night” switch-up by adding my squash blossom and few extra bracelets. Casual summer days are the best. love it!! that necklace is so unique!! love how you kept everything basic and casual! 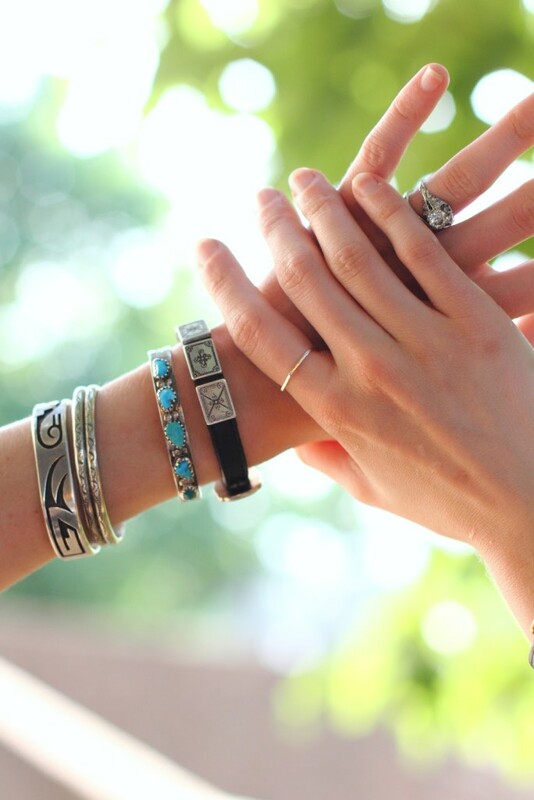 in love with your ring and bracelets! As someone who has never really been into wearing shorts, I hear ya. I have been wearing the hell out of my shorts lately and this cute look gives me so much more inspiration! Great necklaces too dear! That necklace will never get old for me — such a fantastic statement piece worn with neutrals! that lana song is stuck in my head, always! haha. this outfit is so perfect for summer. laid back, cozy, and perfect for this heat wave! No argument there! I love summer evenings too. Great sandals! Oooh, that necklace! How cool is that necklace? Well, both of them. Necklace layering~ get it girl. Your casual summer uniform is totally rad. Those sandals are so stylish, too! Hey, love how you jazz up a simple outfit with all these amazing accessories! Great styling! Love these cutoff shorts, so relaxed and cute! The accessories in this post rock.